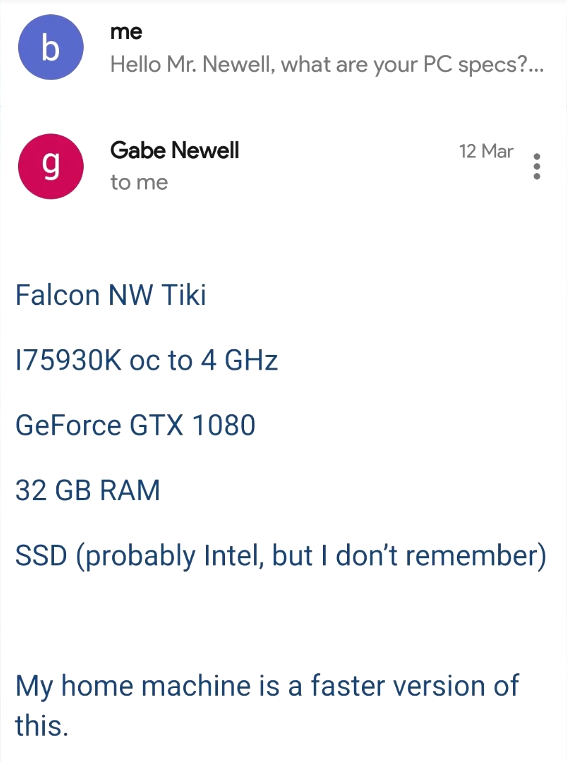 GabeN's specs were revealed in an email thread. What do you think of the Apple Cinema HD Display? I've been using Apple Cinema Displays for several years now with both nVIDIA and ATI display adapters, starting with the original 22" Cinema Display. I was tempted for a while by the Samsung 24" display, but it wasn't a big enough step forward and had problems running at its native resolution with DVI inputs. The 30" version is great, and I would recommend it as a significant improvement over the 22" or 23" versions. It works fine for games or movies. I run 2560 by 1600 for my desktop and for games that support that resolution (e.g. Source games, WoW, ...). I made a half-hearted attempt to get two Apple Cinema HD Displays working simultaneously, but the connectors interfered with each other. Most of the machines at Valve have Dell 24" LCD monitors, and a number of people have those set up in dual monitor configurations. Do you get playable framerates at 2560 by 1600? I get 150 to 170 FPS out of the Counter-Strike: Source VST depending upon what set of tweaks I'm running that day. That's with vsynch disabled, 16X aniso, and 6X AA. This page was last modified on 18 March 2019, at 21:24.